These magnificent holiday accommodations in Proceno are located in a castle in the first town of Lazio just over the border with Tuscany. Dating back to the 12th century, this castle has a pentagonal base which incorporates a main tower and two secondary towers interconnected by walkways and a drawbridge, one of 19 still working in Italy. The castle looms over the Via Cassia and dominates the valley of the Paglia River, with Mount Amiata in the background. 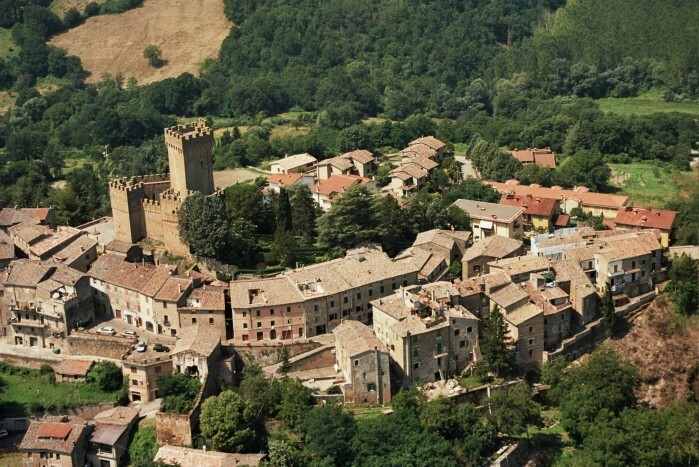 Surrounded by woods and green valleys, this rare example of medieval fortification survives in its original state and offers charming accommodations and a wonderful hospitality, where one can breathe history and culture without renouncing modern comforts. The castle consists of 7 holiday apartments. Three flats are in the 14th century fort attached to one side of the castle by the town’s defensive walls. Although they share a common access, as well as the path leading through the gardens to the swimming pool, each is completely independent and has its own private furnished outdoor area. Clustered around a medieval courtyard are the other four flats, also with private outdoor areas and connected to the swimming pool by an ancient tunnel passing under the castle. All the apartments have a fireplace well stocked with wood for romantic, cosy evenings.